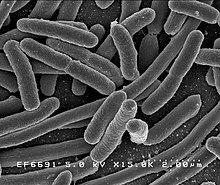 Bacteria ( i/bækˈtɪəriə/; singular: bacterium) constitute a lairge domain or kinrick o prokaryotic microorganisms. teepically a few micrometres in lenth, bacteria hae a wide range o shapes, rangin frae spheres tae rods an spirals. Bacteria inhabit sile, watter, acidic het springs, radioactive waste, an the deep portions o Yird's crust. Bacteria an aa live in plants, ainimals (see symbiosis), an hae flourished in manned space vehicles. ↑ Woese CR, Kandler O, Wheelis ML (1990). "Towards a natural system of organisms: proposal for the domains Archaea, Bacteria, and Eucarya". Proceedings of the National Academy of Sciences of the United States of America. 87 (12): 4576–9. Bibcode:1990PNAS...87.4576W. doi:10.1073/pnas.87.12.4576. PMC 54159  . PMID 2112744. ↑ Woese CR, Fox GE (1977). "Phylogenetic structure of the prokaryotic domain: the primary kingdoms". Proceedings of the National Academy of Sciences of the United States of America. 74 (11): 5088–90. Bibcode:1977PNAS...74.5088W. doi:10.1073/pnas.74.11.5088. PMC 432104  . PMID 270744. This page wis last eeditit on 14 Mairch 2019, at 21:22.